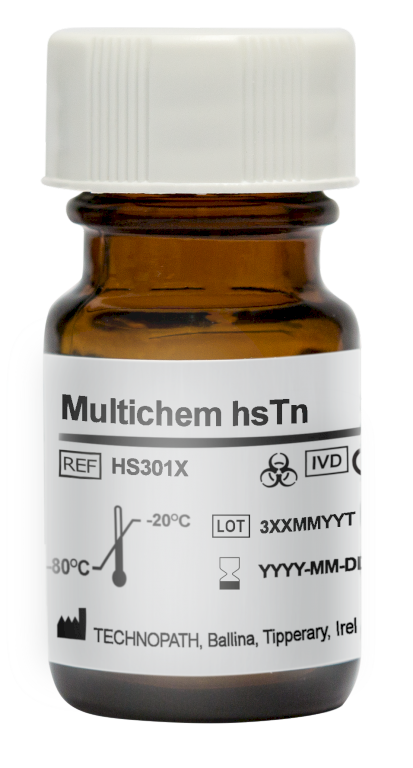 Multichem hsTn Control is intended for use as a third party, single level, liquid stable quality control material to monitor the precision of laboratory testing procedures for high sensitive Troponin Assays. The intended patient population is Cardiac patients, where a requirement has been identified for testing conditions associated with elevated levels of Troponin I and Troponin T.
Multichem hsTn Control is designed as a single level, liquid stable frozen product. The product will typically be run as a low level/high sensitive control, in conjunction with one other level of the Multichem IA /IA Plus series of serum controls for the same analytes, after reagent calibration and at a frequency dictated by laboratory QC procedures and reagent / instrument manufacturer instructions. This product design is based on the existing Multichem IA Plus L1 control, but incorporating the required features of a single low level Troponin Control, to supplement the IA Plus Control to monitor the precision of Troponin assay methods, at the low end of the linear dynamic range .The product should be treated the same as patient specimens and run in accordance with the instructions accompanying the instrument, kit or reagent being used. The control is to be stored at -20°C to –80°C and thawed as per IFU prior to use. The product is to be stored at 2 to 8°C between use.